Most of the complex planning and management issues of weddings across the world are similar. We developed this software with the belief that complex problems require simple solutions. Probably the biggest challenge of them all. You will suddenly recall one more name just at the last moment and need to update all lists quickly. Including them in the invitee list, getting an updated count and like. Easy-peasy with WedPlan. And completely secure too. Sending e-invites in keeping with the current trends? WedPlan lets you send personalized e-invites to your guests with an optional RSVP option. Your guests can just click on the button in the email and update their RSVP status. WedPlan lets you send text (SMS) messages on a pre-defined schedule with smart lists. All new guests added till the time of sending the text get included in the list automatically. Wondering how to keep track of the 1000s of tasks related to the event plans? We have got you covered. WedPlan includes a fully integrated team-based task manager so that you can assign tasks to your friends and family members who are helping you with the arrangements. You need to plan the budget for your wedding, right? WedPlan will make the cost calculations and budgeting process much easier than using clumsy Excel sheets where you need to set formulae for everything. WedPlan includes an event calendar that shows all the events in a nice calendar view including the ceremonies, arrival and departure records for the outstation guests. 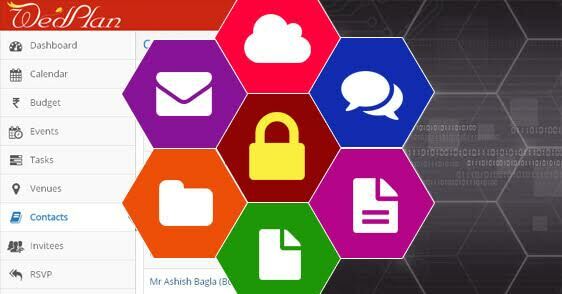 Now you can have complete peace of mind and stay organized. WedPlan helps you to record venue and vendor details in a common location, easy to recall and look up whenever you need it. The software can be used from anywhere, at any time and you just need a browser and an Internet connection. Superb option for a multi-location situation where the different people helping in the planning are in diverse cities or even countries. All these facilities make WedPlan a truly “global” product. There are so many more things you can do through this online wedding planning software. Check them out for yourself. Take this no-obligation, FREE DEMO and discover the pleasure of convenience and power. “How secure will be the data that I enter while using this service?” The data security is a pertinent concern in the minds of many prospective clients of WedPlan. We use secure transport layer HTTPS at WedPlan, which eliminates the chance of snooping while you are accessing the site. The data is also frequently backed up at the server level. When you register for requesting the access to the online demo, you provide us your phone number and email id. But the information stays safe with us and under no circumstances do we share it with any of our other clients or third party businesses. We might follow up with you only when new offers and updates are released or to send requested information. While we have an effective backup provision at our end, as a best practice, you should also periodically backup your data through the export data option. Why Did We Develop a Wedding Planning software? Recently we celebrated our 25th wedding anniversary (thanks for your kind wishes) and while planning the arrangements, guest list, menus, gifts and all the other logistics issues, I extensively used Excel and paper diaries. Soon I got frustrated like crazy. The data was all over the place and I had to personally update everything even though different people were looking at the various aspects of the planning and managing work. A horrifying thought came to my mind – how am I going to handle the management nightmare when my son will get married sometime in near future? I asked around for a good software solution and found that there are no quality software available in the market. A few that were, catered to American style weddings and were all single computer based software resulting in me having to update all the records. What does a software development company do in such situations? It starts looking at building a software to fill the gap. That’s exactly what we did. Of course, we talked around, did some surveys and tried to find out the pain points of other parents who are all facing similar challenges. 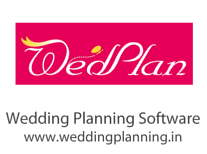 Introducing WedPlan, the wedding planning software that will make your life easier with integrated planning and managing facilities. You don’t need to download or install any software. Just sign-up and start using. Add your family members, friends and relatives who will help you manage the show. Assign responsibilities to people and watch the updates happening in the various areas. Get a summary on a a single dashboard and drill down to any area for a detailed look. Get more free time to enjoy the rituals with your family because the arrangements are proceeding smoothly. Check out the details of the user-friendly software.